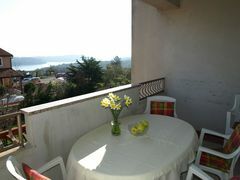 Beautiful Appartment in Istra, Croatia. In the family house, 1st floor, with beautiful sea view. Quite area. Family and children friendly. Suitable for 2,3 or 4 people. Rents available throught the whole year. One bedroom, kitchen with dining room, bathroom, balcony. TV, wireless internet, Air Conditioning. Big garden with playground for children. 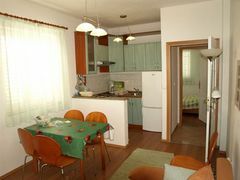 Kitchen – fully equiped and connected to dining room. There are various types of beaches in the area: sand, gravel, rocks, wild beaches surrounded by intact nature, regular and nudist. Other advantages for tourists- hiking, biking, walking , jogging in a protected forest park Soline which is literally 2 meters away from the house. Swimming pool made of plastic- 3 meters long. Distance to the city centre, shopping malls , clubs and restaurants- 5 minutes by car. Protected forest park Soline-for hiking, biking, walking, jogging. Towels and bed clothes included. Cleaning fee included (no additional costs for final cleaning). Check In/Check Out : From June 15th till August 31st- check in and check out on Saturdays. In other periods of the year- Check in and check out can be done any day during the week. Cancellation : Payment in advance on our current account (20% of the total price). In the case of cancellation advance payment will not be returned. Policies : We will ask you to pay 100 Euros as a deposit. That amount will be returned to you at the end of your stay if there are no damages made in the appartment. What to see & do : Watersports, biking, hiking, walking,jogging, carting, horseback riding, organized cruises and boat trips. APPARTMANT “VANILLA” Beautiful Appartment in Istra, Croatia. In the family house, ground floor, with sea view. Quite area. Family and children friendly. Suitable for 2- 4 people. 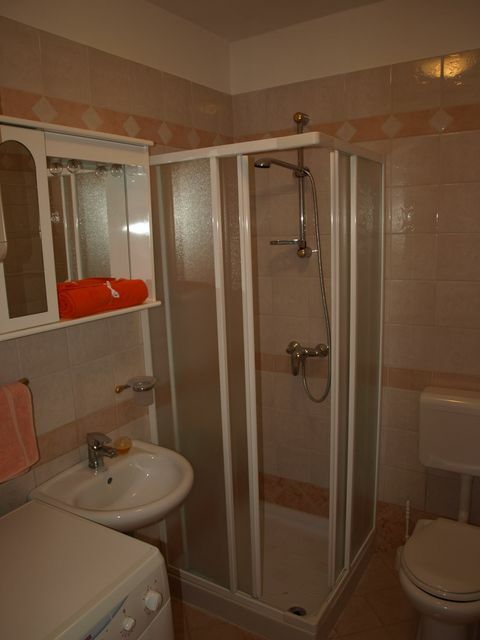 Rents available throught the whole year. 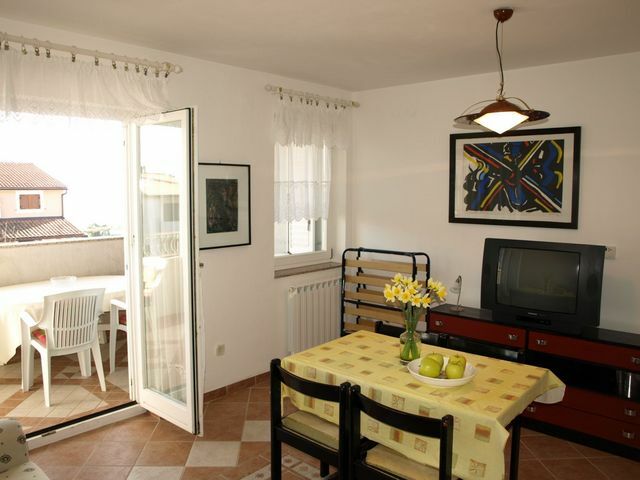 One bedroom, kitchen with dining room, bathroom, big terrace. TV, wireless internet, Air Conditioning. Separate entrance. Parking space available. Big garden with playground for children, grill, and swimming pool 3,2m fi. Pets allowed. 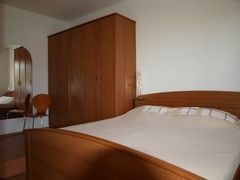 Bedroom- double bed with possibility of one additional bed for a small child; Kitchen – fully equiped and connected to dining room. 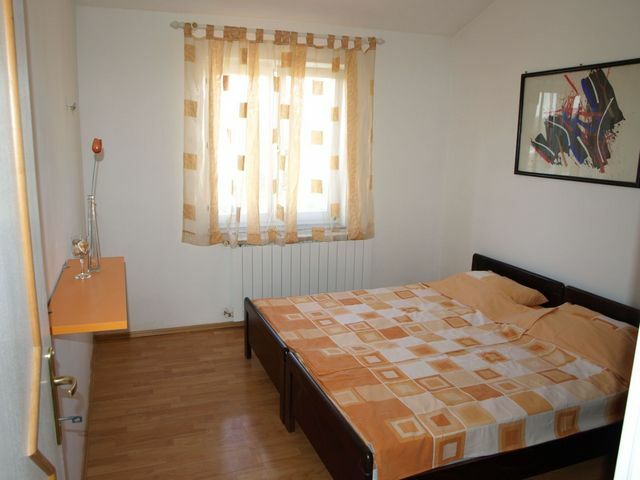 Dining room -Big sleeping sofa for 2 people Big terrace- equiped with sitting set (tables and chairs for several people) Bathrom- equiped with bath tub Distance to the airport – 7 km (4,5 miles). We can provide transport from the airport to appartment and vice versa. Distance to the highway- 7 km (4.5 miles) Distance to the city centre, shopping malls , clubs and restaurants- 5 minutes by car Distance to beaches- closest beach -150 meters ; There are various types of beaches in the area: sand, gravel, rocks, wild beaches surrounded by intact nature, regular and nudist. Other advantages for tourists- hiking, biking, walking , jogging in a protected forest park Soline which is literally 2 meters away from the house. APPARTMANT “PISTACCIO” Beautiful Appartment in Istra, Croatia. In the family house, ground floor, with sea view. Quite area. Family and children friendly. Suitable for 4-6 people. Rents available throughout the whole year. Two bedrooms, kitchen with dining room, bathroom, big terrace. TV, wireless internet, Air Conditioning. Separate entrance. Parking space available. Big garden with playground for children, grill, swimming pool 3,2 m fi. Pets allowed. First bedroom- double bed Second bedroom – bed + bunk beds (total 3 beds) Kitchen – fully equiped and connected to dining room. Dining room -Big sleeping sofa for 2 people Big terrace- equiped with sitting set (tables and chairs for several people) Bathrom- equiped with shower and laundry machine Distance to the airport – 7 km (4,5 miles); we can provide transport from airport to our appartment and vice versa. Distance to the highway- 7 km (4.5 miles) Distance to the city centre, shopping malls , clubs and restaurants- 5 minutes by car Distance to beaches- closest beach -150 meters ; There are various types of beaches in the area: sand, gravel, rocks, wild beaches surrounded by intact nature, regular and nudist. Other advantages for tourists- hiking, biking, walking , jogging in a protected forest park Soline which is literally 2 meters away from the house.